Win Tampa Bay Lightning Tickets! Tune into 10News @ Noon for your chance to win!! 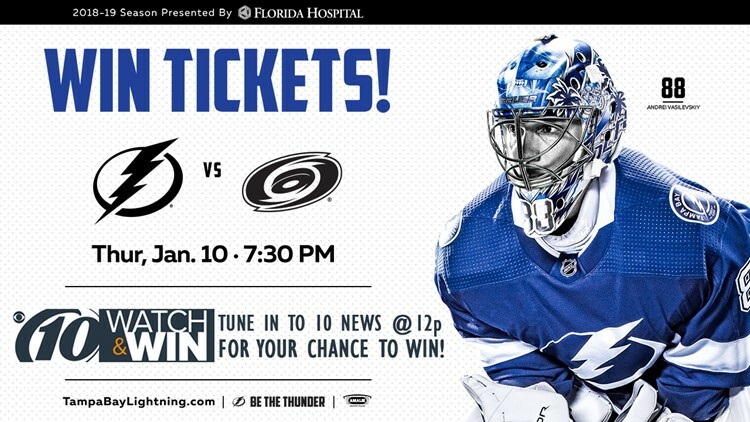 10 News and the Tampa Bay Lighting want to put you in the stands for the game! Text “10 News” to 61873 NOW to be entered to win two lower level tickets to the January 10th, Carolina Hurricanes game and an autographed jersey. (a) The text promotion will begin on Sunday, December 16, 2018, and will conclude on Sunday, December 22, 2018. (b) To participate in the contest, watch 10 News between 12/16 and 12/22, and listen for the secret code word and number to text. WTSP will say the secret code word on-air and prompt viewers to send a text message to enter to win. When the message is said, participants must text the secret text code to 61873 to enter to win. (b) Prize can be won December 16, 2018 through December 22, 2018. (b) One winner will be randomly selected on Thursday, December 27th, 2018, from all contestants that enter the correct code word online or text the correct code word that is revealed in the call to action.